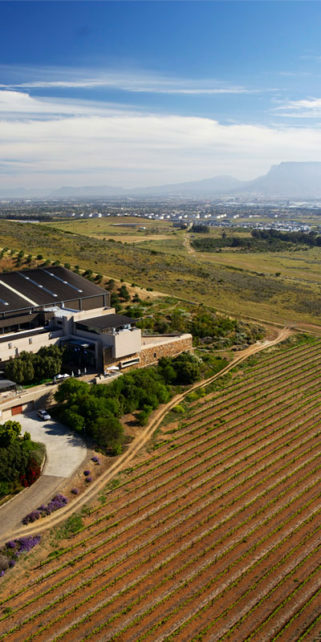 The unique location of Durbanville Hills’ cellar a mere 20 minutes from Cape Town’s city centre, offers not only a spectacular view of Table Mountain and Table Bay, but also an extraordinary terroir that stabilises temperatures and eliminates extremes of heat and cold. Although the Durbanville area is renowned for its Sauvignon Blanc that excels under the cool conditions where it is grown mostly on the cool south facing slopes, the range of red wines also benefit from the warmer valley outskirts and opposing northern slopes. Durbanville Hills would not have existed without the enthusiasm of the winery’s producers and their faith in the high potential of their high-quality grapes. In the late 1990s seven grape farmers and Distell agreed to build a cellar as part of a joint venture to make their own wine. Since the first vintage in 1999, there are nine member farms, all located near the cellar. The member farms are Klein Roosboom (the site of the fresh-water spring that prompted the first farmers to settle in the area), Ongegund, Hillcrest, Maastricht, Morgenster, Bloemendal and Hooggelegen. Another two producers from the farms Welbeloond and De Grendel recently joined the cellar. Such is the heritage of the region that the youngest of these farms, Klein Roosboom, was established in 1714 and the oldest, a mere three years after those established in the Constantia area in 1685.